Needle Exchange » Belated FO Post: Spectator Grand hat! « In which Eve puts Search Engine Sunday into hibernation (for now). Belated FO Post: Spectator Grand hat! Yarn: Freedom Cotton DK by Twilleys of Stamford, Shade 08. Dimensions: Wide brim, 21″ hat band, which was a bit small. The measurements were taken from the inside of another hat that fit well, and I think an inch or so was cut off because it wasn’t done directly around the head. The band measurement should really have been 22-23″ instead of 21. Would I knit it again? I would, but I would use the base design and implement my own stitch pattern. I’d also use a different type of wire, because this wire loved kinks. I knit this for my aunt, just in time for the garden party she throws every year. 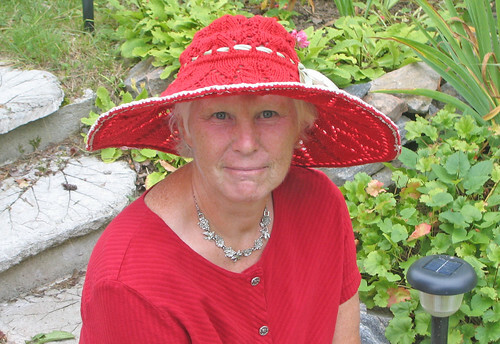 She’s a member of the red hat society, which is why this hat is yet another red project. It turned out really well, and she got lots of compliments about it Matter of fact, one of the people at the party was a milliner and even she said she really liked it! She was wearing a hat that she had made herself that was 100,000,000 times better, made with all sorts of fantastic fashion-sounding components and apparently certain products that have to be used in well-ventilated areas. So she said she had plenty fun making it in a badly-ventilated area. Altered states improve creativity? I’ll buy that. I was really surprised how easy and quick it would be to knit this hat. Although I would have liked a little extra guidance on things like wire and yarn choice, this was an okay pattern to knit. Definitely not something for a beginner. I like to think I’m at least an “intermediate” knitter, and I had quite a few problems with it. However, having to answer all those questions by myself means that I now know exactly how to knit a hat like this and could easily adapt any lace stitch pattern to make a similar hat. It’s not mentioned in the pattern, but I sent an email to Annie Modesitt (!) and she said that the charts on page 11 are alternatives to the Horseshoe & Double Pointelle chart. I chose to stick with the Horseshoe & Double Pointelle chart because I thought it looked the prettiest. I learned one really neat thing about multiple yarn overs through this Lace Extravaganza site: if you’re doing a double yarn over, you’re supposed to knit into the first yo and purl into the second. I couldn’t figure it out for a long time because this wasn’t indicated in the pattern. I was about to bother Annie yet another time to ask why she hadn’t asked for this, until I realized that it was because of the way she structured her chart. She’s writing for 3 different sizes, so she wrote the pattern for a large crown and then cut off a stitch on the side for a medium and another stitch for a small. For the medium there’s a knit between two yos, but for the small there isn’t. It’s hard to indicate in the chart to “purl if it’s a small, otherwise knit,” so I guess she just opted to leave it out and hope people would understand. So here’s a note to anyone who’s planning on knitting this in a small: any time you’ve got two yarn overs, even though it’s not in the pattern you should be knitting into the first yo and purling into the second. Wow! That’s gorgeous, and it looks lovely on your aunt. Very well done!! This is fabulous! It looks wonderful and is perfect for your giftee. A hat that couldn’t be more perfect for your Aunt. She looks like a real model wearing a designer hat for a magazine, in fact. Great job! This entry was posted on August 28th, 2006 at 3:24 pm and is filed under Finished Projects, Spectator Grand. You can follow any responses to this entry through the RSS 2.0 feed. Both comments and pings are currently closed.